ATOMIC_AGGREGATE – inform other routers that some part of BGP attributes are missing like complete AS_PATH, NEXT_HOP. 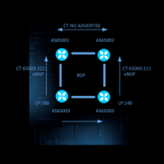 To prevent the routing loops from occurring, BGP process creates a new static route to Null0 for every aggregate statement. *> 50.0.0.0/24 0.0.0.0 0 32768 ? *> 50.0.1.0/24 0.0.0.0 0 32768 ? *> 80.50.0.0/24 0.0.0.0 0 32768 ? *>i50.0.0.0/24 80.50.0.1 0 100 0 ? *>i50.0.1.0/24 80.50.0.1 0 100 0 ? r>i80.50.0.0/24 80.50.0.1 0 100 0 ? summary-only – to automatically suppress advertainment of more specific prefixes. s> 50.0.0.0/24 0.0.0.0 0 32768 ? s> 50.0.1.0/24 0.0.0.0 0 32768 ? suppress-map – to selectively suppress advertainment of some prefixes. as-set – to restore the whole set of AS_PATH information and include it in aggregated prefix, the ATOMIC_AGGREGATE attribute is not needed any more. *> 50.0.0.0/16 0.0.0.0 100 32768 ? *>i50.0.0.0/16 80.50.0.1 0 100 0 ? attribute-map – to assign specific attributes for new aggregate prefix and override the current ones. advertise-map – to choose specific prefixes for composing new set of attributes such as AS_SET for aggregate prefix.